LOUISVILLE, Ky. - Valhalla, the name of the Jack Nicklaus-designed golf course that's hosting the 96th PGA Championship, comes from Norse mythology. According to Merriam-Webster, Valhalla is "the great hall where heroes slain in battle are received." Put another way, it's a place of honor, glory, even happiness. Could this be why Tiger Woods appeared early this afternoon for a much ballyhooed practice round? Woods, no doubt, is a golf hero. And he has, in a sense, been slain in battle, most recently when back spasms forced his withdrawal during the final round of last week's Bridgestone Invitational. He is now in Louisville and will tee it up with Phil Mickelson and Padraig Harrington at 8:35 a.m. for Thursday's first round. When I arrived here this morning, Tiger's status was a mystery, and on many people's minds. Would he show up for the year's final major, his last slim hope to earn a spot on Tom Watson's U.S. Ryder Cup team? Then, at about 1 p.m., there he was warming up on the range. A little more than an hour later he teed off with Steve Stricker, Davis Love and Harris English for nine holes of practice. Tiger swung his driver on the 1st tee with no apparent wincing, although he picked up his tee gingerly. Tiger spoke briefly with the media. He explained that his recent back problem "is something totally different." Apparently, the spasms were not related to his back surgery. "I'm not in any pain," he said. "That is the good part." After the interview, Tiger put aside his sticks and walked the back nine to get a look at the rest of the golf course. For Tiger and the other 150-plus players in the field, Valhalla Golf Club will be a worthy test. The PGA-owned course has hosted the PGA Championship on two other occasions: in 1996 when Mark Brooks beat Kenny Perry in a playoff and in 2000 when Woods defeated Bob May, also in a playoff. 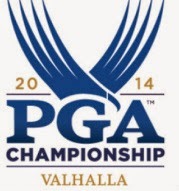 This time Valhalla will play to a par of 71 instead of 72. The 2nd hole has been converted into a 500-yard par 4. At 7,548 yards, Valhalla is not the longest championship course, but it will be plenty long enough. Sergio Garcia said this morning in a press conference that Valhalla favors long hitters, especially those who tend to hit it straight. Think Rory McIlroy. Hitting approach shots into Valhalla's undulating greens will not be as difficult for players who have shorter irons in their hands, or who are able to loft high shots at small target areas. This afternoon I walked some holes on the back nine. The course is in immaculate condition. This may be the bluegrass state, but Valhalla is lush and green, with the fairways like smooth carpet and the rough looking stout but not exceedingly long. Considering the '96 PGA, the '00 PGA and the '08 Ryder Cup, this rolling acreage on Shelbyville Road has produced a lot of drama. Beginning tomorrow, sold-out crowds will be on hand for what should be another exciting week in Louisville. Tiger ought to stay home & get fit .He withdrew from WGC cuz of another injury,unbeknownst at the time because of his previous back surgery....And I am a very big of the wizardry Tiger displayed early in his PGA career. This is truly sad, you can't play good golf hurt hence his dismal performance thus far. The guy really ought to get healthy then try again. Very sad to see this folks. But he is the Tiger. It will be interesting to see how Tiger does this week without much prep. The first challenge is to make the cut on a championship course he hasn't competed on in 14 years. This should be interesting to see. Hopefully, Tiger is in a good enough condition for this. If he is, it may just be his chance to prove himself that he's still got it.